Look what I found on my road trip last week. The tag said "dog bed!" But I think this shallow basket was used to gather flowers from the garden. It certainly will also be useful when we harvest the grapes in September. I also found these lined beverage containers, which I plan to use for an upcoming party in August. They will add a rustic, wine country vibe to the bar. One for beer and one for wine! This tray that we found in Carmel a few months ago finally found a home. It corrals a confit pot and a couple of rosemary topiaries, making an unexpected centerpiece. I don't think a person can have too many baskets, don't you think? There are just so many uses for them! I love baskets too! What a great find in those lined baskets for wine, etc. I would love to find some of those myself. Your tabletop vignette in the last picture is gorgeous. I agree...I love baskets, as you said there are so many uses and they add a wonderful touch of texture. baskets for sure. i have to sneak some into our house to avoid the amusing husband eyeroll. i also would add vintage boxes/crates to the list. anything to hold things. love the tray on the table with the topiaries. very rustic. Aren't you glad baskets have come back into vogue? It seems for several years they weren't as popular. I love them. No... never!! Love all your baskets! Love your new baskets, Delores. I am a basket addict too! Delores, I'm a "basket" case too. Baskets seem to follow me home, always have. They are so useful and the textures and handmade quality appeal to me. Another "basket case" here, too. I have sooo many. Love your beverage serving ones and the one you found in Carmel, too. Great color on the wicker. I love baskets--can move them around and so perfect for parties and entertaining! Great finds! we need another shopping trip! One can never have too many baskets...love all of our baskets...especially the ones you will be using for beverage containers!...I have some baskets with plastic inserts that I use for beverages...they say that wood is the best insulator...and the ice does last longer in those baskets...! I, too, am a Basket Case!!! 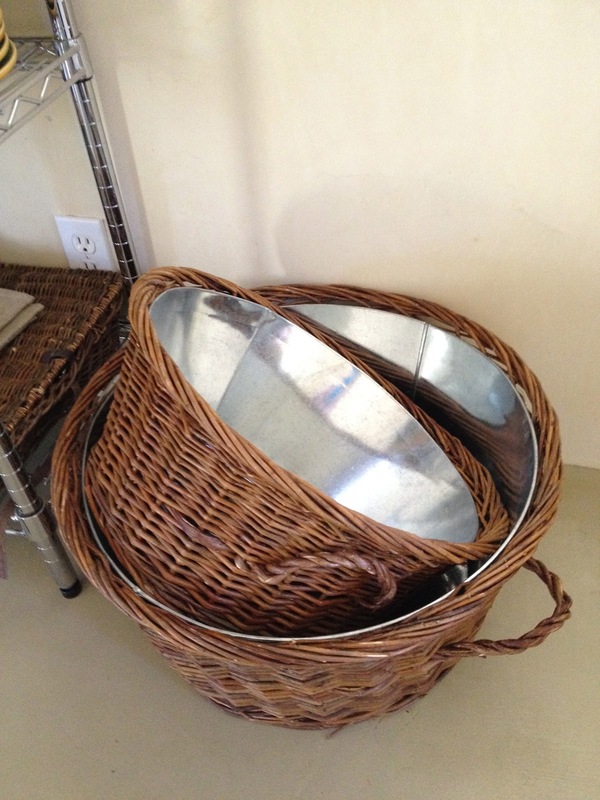 These past few weeks I've been on the hunt for two oval bushel baskets for my laundry. No luck...but I'm still hunting! Love your newest find...I agree it's purpose was probably for "gathering" produce of some sort! Love those lined baskets, too! Those are some great finds. I love the first one. what a lucky dog if he had that basket for a bed! (probably didn't appreciate it, though) Love the baskets for beer and wine!...must try to find some! I agree. Baskets are one of those things I always look for when I'm shopping. So many fun shapes, sizes and so many uses.